The Federal Bureau of Investigation (FBI) has relied on member-informants to help investigate La Cosa Nostra (LCN) ever since Joseph Valachi began to "talk." Mobsters who secretly turn against "La Cosa Nostra" are in a position to give the FBI access to the history and activities of crime groups that is hard to equal. Some, like Valachi, testify publicly and become household names, but most remain unknown to the public and to the organization itself. In the late 1960s, a Florida-based member of the Bonanno Crime Family began to cooperate with the FBI. He shed light on gangland murders, spilled secrets about LCN members and gave the FBI a front row seat to the turmoil within the Bonanno organization. His cooperation was never suspected by his crime family, and he died a member in good standing. Now, clues found in declassified FBI documents may help to reveal his identity for the first time. The FBI thought the "veteran hoodlum [had] exceptional potential to assist the Bureau." To conceal his identity, the FBI referred to the informant by the symbol number "MM-1231-C-TE." The two-page report was short on details about the informant but it did establish that he was an old-time Bonanno Crime Family member living in the Miami-area. Trying to discern the identity of a LCN informant using only his crime family affiliation and city of residence would ordinarily produce too many suspects to be much use. For example, the Bonanno Crime Family alone had well over one hundred members in the New York City-area at the time. But the number of LCN members in South Florida was much lower. Locating additional evidence identifying William Dara as the Florida-based Bonanno Crime Family informant within the few available FBI documents is easier said than done. The FBI tries to preserve the anonymity of an informant, even after he dies. FBI reports are written in such a way that details that could be used to help unmask him, like age or criminal history, are generally omitted. If they are included, they usually get redacted before a report is declassified. Sometimes, though, things slip through. FBI agents were obliged to furnish regular reports about their LCN investigations, whether they had new information or not. To help meet that requirement, as former FBI agent Anthony Villano noted in his memoir, agents regularly padded new reports with old Intel. The result was Intel that was omitted or redacted in one report was sometimes included in another. By comparing reports, details that seem innocuous in one context can become revealing in another. The report is significant because it establishes that informant "MM 1231-C-TE" was present at those meetings. Details about the two meetings were included in another FBI report, but this time all the participants were identified by name. The second report shows that Dara was the unknown informant referred to in the first report. And it confirms, in all likelihood, that Dara was the Florida-based Bonanno Crime Family member. The suspicion that the informant and William Dara are one and the same was backed up in another FBI report. In 1967, the informant told federal agents that he was sixty-two years of age. This was consistent with Dara who was born in 1905. William Joseph Dara was born July 12, 1905, in Sicily, the first-born child of Nicholas and Susana Dara. Dara immigrated to the United States with his mother in 1910. His father had immigrated to New York City in 1907. Census records show Dara completed school to the eighth grade and then became a tile setter in the construction trade. This line of work would give Dara his mob moniker of "Willie the Tile Maker." By this time, William Dara was already an inducted member of the Bonanno Crime Family. Dara told the FBI in September 1967 that he "was initiated into the [Bonanno Crime Family] during the year (approximate) 1949 or 1950. The ceremony, if such is the proper terminology, took place at a restaurant in Manhattan, ...there were ten initiatives, including himself, at the banquet." His sponsors were Mike Sabella and "Mariano." Michael Sabella was a longtime Bonanno Crime Family capodecina and one-time associate of former boss Joseph Bonanno. He was also Dara's third cousin and likely his connection to the Bonanno organization. According to Dara, Sabella "was formerly the number one man under Bonanno." Dara was with his superior, Sabella, when he met twice with Paul Vario in April 1968. Sabella was an important leader under Carmine Galante in the 1970s but was later tripped up in the FBI's Operation Donnie Brasco investigation into the Bonanno Crime Family. The bulk of Intel presumably supplied by William Dara is still buried in his FBI informant file. What's freely available now is a small number of FBI documents that only incidentally touch on his criminal activities. This article contains Intel supplied by an informant thought to be Dara. It was collected by sifting through available FBI documents and cross-referencing the informant symbol number, dates, names and content. Certain things disclosed by William Dara seem to have been at odds to what is generally understood about LCN history. This is consistent with many informants who unintentionally (or intentionally) passed on a measure of misinformation or exaggeration when trying to recall details from long ago or outside their personal experience. William Dara was a friend of Jimmy Plumeri and met with him in Miami. Dara seems to have been tight with a number of influential Lucchese Crime Family members, in part, through his association with Michael Sabella. After Thomas Lucchese passed away in 1967, Plumeri was thought by law enforcement to be a candidate to replace him as boss. Plumeri, on the other hand, told Dara that he planned to retire. Dara said that Plumeri was an alcoholic. Plumeri reportedly bragged to Dara that "I [sic] been accused of having millions. This is not true. I'm worth zillions." South Florida was filled with mobsters from all over and Dara told the FBI about their activities. On August 14, 1967, Dara advised the FBI that Joseph Bonanno had regained control of his crime family and that former members who had taken protection from the Gambino Crime Family during the "Banana War" had returned to the fold. He also stated that it was still possible that a "war was about to start in New York City over control of LCN." The instability of the situation was evident when Dara advised on September 4 that representatives from the Gambino, Genovese and Lucchese Crime Families had met and determined that Joseph Bonanno was "completely crazy" and "unmanageable." Bonanno was a "dead man." His son Bill Bonanno was to be killed too. Sabella went on to tell Dara that "Bonanno has threatened to 'call out' his 'goon squad' of hired assassins if his demands are not met." He was "fearful that a 'war' is about to start in New York City." Dara went on to say that it was his capodecina Michael Sabella who had warned Carlos Gambino and Thomas Lucchese about Joseph Bonanno's alleged plot to eliminate them and takeover over the LCN in New York City. According to Dara, Bonanno had wanted to unite all the New York City crime families under him and become "capo di capi". Bonanno tried to kill Sabella for the betrayal. This is contrary to the popular understanding that it was Joseph Colombo who had denounced Bonanno to the LCN Commission. Michael Sabella told Dara in January 1968 that a meeting would soon be held at the home of Paul Vario to select a new boss to replace Joseph Rosato. Participants would arrive by boat because Vario lived on the shore of Long Island, New York. Sabella said all LCN families would now "be headed by two individuals rather than one." Dara didn't elaborate on who ordered this new directive or what became of it. There is no evidence that this became policy. In October 1968, Dara told the FBI that Aniello Dellacroce was made the new boss of the Gambino Crime Family. Dara refers to him only as "Mr. Neil" so it's unclear how well he knew Dellacroce or how much he knew about the situation. In the late 1970s, former FBI agent Joseph Pistone was able to infiltrate the Bonanno Crime Family as a gangster known as Donnie Brasco. In his memoir about his undercover work, Pistone wrote that he crossed paths with many local Bonanno Crime Family members in South Florida but he never acknowledged meeting William Dara, at least publicly. If Dara was on the street at the time, Pistone should have met him. William Dara showed his value to the FBI soon after he began to cooperate when he broke down the murder of Gambino Crime Family member Thomas "the Enforcer" Altamura in October 1967. The killer was an associate of Dara's named Anthony "Big Tony" Esperti. Thomas Altamura was a well-known loanshark and bookmaker in the Miami-area. He was close to Santo Trafficante and had a reputation as a killer. Anthony Esperti was a former boxer from New York, who once went three rounds with Cassius Clay (later Muhammed Ali) in 1961. A thief and a muscleman, Esperti was connected to a series of bombings of restaurants in the Miami-area. The available FBI reports don't lay out why William Dara decided to cooperate with law enforcement. Besides being in his interest, of course, two events likely played a part: the armed conflict within the Bonanno Crime Family and a criminal conviction. The so-called "Banana War" was the backdrop for every Bonanno Crime Family member during the 1960s. The intra-family conflict was set off after longtime family boss Joseph Bonanno, who had fallen out of favor with rival crime family bosses, tried to promote his son over other senior members. This led to a shooting conflict between pro-and anti-Bonanno factions within the crime family. Members were forced to take sides, and some were killed. 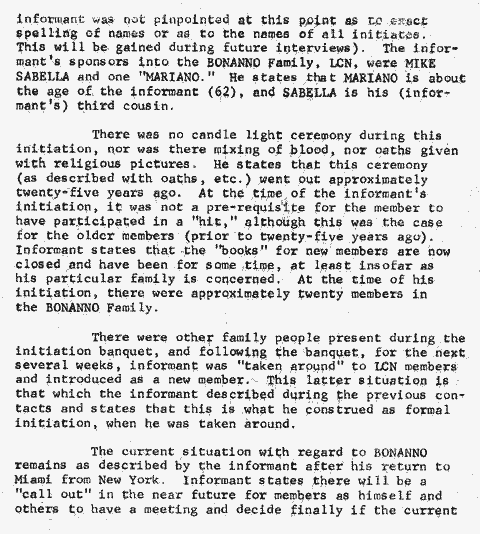 Former FBI Director J.Edgar Hoover once observed that some of the best LCN member-informants were first developed during periods of internal conflict within a crime family. The factions within the Bonanno Crime Family would eventually settle their differences and reunite under new leadership, but not before Dara would run into his own trouble with the law. Dara was sentenced August 16, 1967, to seven and a half years in prison. Codefendants Samuel Farinella and Anthony Esperti were sentenced to ten years in prison. Dara was sentenced to less time because of a serious heart condition. Esperti was in the process of appealing this conviction when he murdered Thomas Altamura. The court trial was a financial strain on the sixty-two-year old Dara. After it ended, he told the FBI that he had an appointment to meet with Michael Sabella in New York to borrow money and get back on his feet. Important LCN informants typically received financial compensation from the FBI for cooperating, so this may have been another incentive for Dara. One of the first times William Dara is thought to have talked was on August 18, 1967, two days after he was sentenced, when he sat down with FBI agent Ralph Hill. Hill was the same agent who had investigated the Chicago Outfit with William F. Roemer in the 1950s and 60s, before he transferred to the Miami field office. Dara might have been the first Miami-area LCN member to cooperate with the FBI. Dara was a diligent informer. Here is example of some of Dara's contacts with federal agents in August 1976. And then two days later, on August 31, he told the FBI that his criminal associate Stephen Maruca had opened up a new business called Al's Vending Company in Hallandale, Florida. Eight years after he first began to cooperate, Dara was still a productive informant. If William Dara was the Florida-based Bonanno Crime Family informer, as is suspected, an unfiltered look at his entire FBI file would help to bring the turbulent history of the Bonanno Crime Family in the 1970s into sharper focus. This work is dedicated to the memory of Edmond Valin, Sr.
1 FBI, La Cosa Nostra, C.A. Evans, Aug. 21, 1964, NARA Record No. 124-10223-10455. According to the FBI, "there is no adequate substitute for a member-informant, or a sensitively placed highly confidential source [listening device], for the development of accurate information on [La Cosa Nostra]." 2 FBI, MM 1231-C-TE TECIP, FBI Director, Sept. 7, 1967, NARA Record No. 124-10293-10350, p. 4. 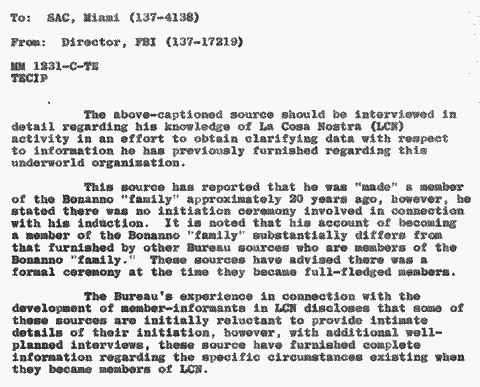 The document refers to "other Bureau sources who are members of the Bonanno 'family.'" This would indicate that there were at least two other Bonanno Crime Family member-informants besides Dara. Research indicates a member from Arizona, a member from New York City and Salvatore Bonanno had all cooperated by this time. 3 LCN informant symbol number has three parts: 1. the field office handling the informant (MM=Miami), 2. a number unique to the informant in that office, 3. the informant's importance and level of cooperation (C-TE=Top Echelon Informant). 4 Mafia Membership Charts, mafiamembershipcharts.blogspot.com. An excellent reference site for LCN members sorted by era and crime family. 5 FBI, La Cosa Nostra Miami Division, Miami Office, Sept. 11, 1967, NARA Record No. 124-10293-10346; FBI, La Cosa Nostra, Miami Office, Oct. 28, 1967, NARA Record No. 124-10293-10318. 6 FBI, La Cosa Nostra Miami Division, Miami Office, Aug. 22, 1968, NARA Record No. 124-10297-10125, p. 15. 7 The LCN reports used here were declassified as part of a general release of thousands of files related to the FBI's investigation into the John F. Kennedy assassination. Less than 30 pages appear to have any connection to Dara. 8 Certain exceptions include a co-operating witness like Joseph Massino or a controversial informant like Gregory Scarpa. 9 Villano, Anthony, with Gerald Astor, Brick Agent: Inside the Mafia for the FBI, New York: Quadrangle, 1977, p. 85. "...the system demanded a report on a case every forty-five days whether or not anything new had occurred." 10 FBI, La Cosa Nostra AR- Conspiracy, Miami Office, April 26, 1968, NARA Record No. 124-10288-10463. The informant indicated that Vario and Sabella had recently reconciled. Vario was mad at Sabella for leaving the protection of the Lucchese Crime Family and returning to the fold of the Bonanno Crime Family. 11 Coco and Plumeri were high-ranking Lucchese Crime Family members, and Sabella was a high-ranking Bonanno Crime Family member. The informant is likely a LCN member, since all the other participants were inducted. 13 FBI, MM 1231-C-TE, Miami Office, Sept. 15, 1967, NARA Record No. 124-10293-10312. 14 MooseRoots, us-census.mooseroots.com; Gainesville Sun, July 14, 1982. The newspaper account states Dara was born in New York City but was raised in Sicily. 15 "New York Passenger Arrival Lists (Ellis Island), 1892-1924," database, FamilySearch. A "Nicolo Dara" arrived at Ellis Island on Sept. 5, 1907. His last residence was Mazzara, Sicily. Nicholas Dara listed his occupation as "barber" in the 1930 U.S. Census. Brooklyn Daily Star, April 4, 1912. A "Nicholas Dara" of Oyster Bay, NY, was fined and sentenced to 10 days in jail for contempt for refusing to testify in court over a liquor tax violation case against another man. It's unclear if there was a relationship to William Dara but this individual was also identified as a "barber." 16 Dara listed his occupation as "tile setter" in the 1930 U.S. Census, and "tile worker" in the 1940 U.S. Census. 17 Long Island Star-Journal, Dec. 23, 1948. Brother Salvatore Dara was arrested for bookmaking in Long Island City. Brooklyn NY Daily Eagle, Oct. 11, 1931. Dara and his brother Michael were charged with robbing a slot machine. 18 According to the 1940 U.S. Census, his wages for the year were $550.00. He worked a total of 22 weeks all year. He lived at 584 Crescent St., Brooklyn. 19 Gainesville Sun, July 14, 1982; New York Times, April 14, 1940. He was arrested for vagrancy. He lived at 326 Vermont St., Brooklyn. 20 Brooklyn Eagle, Oct. 25, 1950. Dara was one of 28 "hoodlums" rounded up from the Brooklyn underworld. The newspaper reported that Dara hadn't worked in the last eight years. He lived at 939 Belmont Ave., Brooklyn. Joseph Dara, his brother, was also arrested. 21 FBI, MM 1231-C-TE TECIP, Miami Office, Sept. 15, 1967, NARA Record No. 124-10293-10312. Two other inductees were "Pepe" and "Farni" (last names unknown). 22 FBI, La Cosa Nostra Miami Division, Miami Office, Aug. 22, 1968, NARA Record No. 124-10297-10125; Mafia Membership Charts, mafiamembershipcharts.blogspot.com. Although Sabella was younger than Dara, he was inducted into LCN earlier. Sabella was born in Brooklyn, New York. He came up under capodecina John Bonventre and later succeeded him in the 1940s. Sabella was especially active in the Little Italy section of Manhattan. He died in 1988. 23 FBI, La Cosa Nostra Miami Division, Miami Office, Sept. 11, 1967, NARA Record No. 124-10293-10346. 24 FBI, Crime Conditions in the Miami Division, Miami Office, Nov. 15, 1963, NARA Record No. 124-10208-10000, p. 55. 25 FBI, Criminal Intelligence Program Miami Division, Miami Office, Aug. 31, 1962, NARA Record No. 124-10194-10175. 26 FBI, La Cosa Nostra Anti-Racketeering - Conspiracy, Aug. 12, 1963, NARA Record No. 124-10220-10110. The FBI appears to have been reluctant to disclose all its sources in order to protect them, especially after the murder of Gambino Crime Family member-informant Alfredo Santantonio. FBI, Memorandum, Philadelphia Office, May 12, 1967, NARA Record No. 124-10286-10493, p. 6. "A member can only be identified through a highly confidential source [listening device] or an admitted member." 27 FBI, La Causa Nostra, New York Office, Jan. 31, 1963, NARA Record No. 124-10211-10300, p. 51. 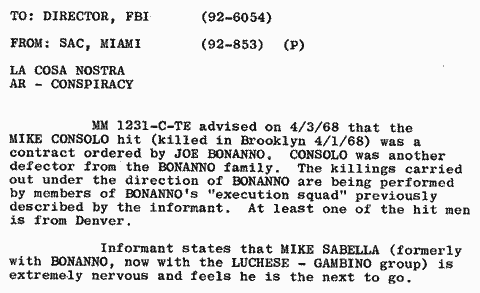 It appears the FBI had not yet developed a member-informant in the Bonanno Crime Family at the time of the hearings. FBI, Criminal Intelligence Program, New York Office, Aug. 16, 1963, NARA Record No. 124-10212-10393. Many LCN members already secretly identified by Gregory Scarpa and Alfredo Santantonio weren't included on the Family Charts. 28 FBI, La Cosa Nostra Miami Division, Miami Office, Dec. 13, 1963, NARA Record No. 124-10277-10299, p. 2. 29 FBI, MM 1231-C-TE TECIP, Miami Office, Aug. 21, 1967, NARA Record No. 124-10293-10329, p. 4. 30 Mafia Membership Charts, mafiamembershipcharts.blogspot.com. Research indicates the Bonanno Crime Family had significantly more members than 20 at this time. Dara could have meant that his capodecina oversaw a regime of 20 soldiers. 31 FBI, MM 1231-C-TE TECIP, Miami Office Sept. 7, 1967, NARA Record No. 124-10293-10350. 32 FBI, MM 1231-C-TE TECIP, Miami Office, Sept. 15, 1967, NARA Record No. 124-10293-10312. Dara said these requirements "went out approximately twenty-five years ago" which would be circa 1942. FBI, Criminal Digest, March 11, 1963, NARA Record No. 124-10220-10084, p. 7. Genovese Crime Family capodecina Angelo De Carlo complained that many new LCN members had never killed anyone. "They shouldn't let nobody in this unless he's croaked a couple of people. Today you got a million guys in here that never broke an egg." 33 FBI, Santo Trafficante, JR aka Jose Trafficante, Miami Office, Aug. 19, 1968, NARA Record No. 124-10213-10143, p. 26. 34 FBI, MM 1231-C-TE TECIP, Miami Office, Aug. 21, 1967, NARA Record No. 124-10293-10329. 35 FBI, MM 1231-C-TE TECIP, Miami Office, Aug. 21, 1967, NARA Record No. 124-10293-10329. 36 FBI, La Cosa Nostra, New York Office, Sept. 26, 1968, NARA Record No. 124-10290-10437, p. 188. 37 FBI, La Cosa Nostra, New York Office, Sept. 26, 1968, NARA Record No. 124-10290-10437, p. 61. 38 FBI, Santo Trafficante, Miami Office, June 14, 1968, NARA Record No. 124-10197-10297. 39 FBI, Santo Trafficante, Miami Office, Dec. 12, 1968, NARA Record No. 124-10213-10200. 40 FBI, Santo Trafficante, JR., Miami Office, Sept. 13, 1967, NARA Record No. 124-10200-10227, p. Cover-C.
41 FBI, Pasquale Michael Erra, aka., Miami Office, June 18, 1967, NARA Record No. 124-10279-10231, p. 4. FBI, La Cosa Nostra, New York Office, Sept. 26, 1968, NARA Record No. 124-10290-10437, p. 61. 42 FBI, TECIP La Cosa Nostra, Miami Office, June 21, 1968, NARA Record No. 124-10226-10167. Some LCN members mentioned were Genovese Crime Family members Rocco Pellegrino, Frank "Hialeah" Pelliccio, and Henry Rubino, Gambino Crime Family member John Tronolone and Lucchese Crime Family member Salvatore "Sal the Sailor" Ciccone. FBI, La Cosa Nostra Miami Division, Miami Office, Aug. 22, 1968, NARA Record No. 124-10297-10125. 44 FBI, Santo Trafficante, JR., Miami Office, Sept. 13, 1967, NARA Record No. 124-10200-10227, p. Cover-C. FBI, MM 1231-C-TE TECIP, Miami Office, Aug. 21, 1967, NARA Record No. 124-10293-10329, p. 4.According to Dara, the shipment was never delivered because plans had not "jelled". 45 FBI, La Cosa Nostra Miami Division, Miami Office, Aug. 22, 1968, NARA Record No. 124-10297-10125. 46 FBI, MM 1231-C-TE TECIP, Miami Office, Aug. 21, 1967, NARA Record No. 124-10293-10329. Plumeri said that Vario was not under consideration to be the next boss. 47 FBI, La Cosa Nostra, Miami Office, March 30, 1069, NARA Record No. 124-10297-10094. 48 FBI, David Yaras, Miami Office, Nov. 21, 1967, NARA Record No. 124-90073-10039. 49 FBI, Samuel Giancana, Miami Office, Sept. 6, 1967, NARA Record No. 124-10195-10197. Dara's information was problematic at best. He acknowledged that Giancana may have been replaced as Outfit boss by this time but the proceeds from the bombing operation would still go to him or the Chicago Outfit. Information from other sources indicated the individual likely responsible for the bombings was Tony Esperti, a Dara associate. This would indicate that Dara likely knew much more about the bombings than he let on, or in fact, he was involved to some degree. Furthermore, Frank Rosenthal, later made famous by director Martin Scorsese in the movie Casino, was not known to be involved in violent crime and unlikely to be behind such actions. 50 FBI, Carlos Marcello, Miami Office, Jan. 23, 1968, NARA Record No. 124-10215-10099. Source T-16 is Dara. 51 FBI, La Cosa Nostra, New York Office, Sept. 26, 1968, NARA Record No. 124-10290-10437, p. 255. 52 FBI, La Cosa Nostra Miami Division, Miami Office, Aug. 22, 1968, NARA Record No. 124-10297-10125. 53 Vario was based in Brooklyn, parts of which are a Bonanno Crime Family stronghold. If Vario had come up with the Bonannos, it might explain why he seemed to be involved in their affairs. 54 FBI, La Cosa Nostra, New York Office, Oct. 20, 1967, NARA Record No. 124-10277-10308, pp. 48-49. 55 FBI, La Cosa Nostra, New York Office, Oct. 20, 1967, NARA Record No. 124-10277-10308, p. 49. 56 FBI, La Cosa Nostra AR-Conspiracy, Miami Office, Sept. 5, 1967, NARA Record No. 124-10293-10348. 57 FBI, La Cosa Nostra AR-Conspiracy, Miami Office, Sept. 6, 1967, NARA Record No. 124-10293-10333. FBI, La Cosa Nostra, New York Office, Oct. 20, 1967, NARA Record No. 124-10277-10308, p. 49. 58 FBI, La Cosa Nostra, New York Office, Oct. 20, 1967, NARA Record No. 124-10277-10308, p. 49. 59 FBI, La Cosa Nostra AR-Conspiracy, Miami Office, Oct. 29, 1968, NARA Record No. 124-10293-10243. 60 Bonanno, Joseph, with Sergio Lalli, A Man of Honor: The Autobiography of Joseph Bonanno, New York: Simon & Schuster, 1983, p. 291. 61 FBI, MM 1231-C-TE TECIP, FBI Director, Sept. 7, 1967, NARA Record No. 124-10293-10350. 62 Bonanno Crime Family capodecina Thomas "Smitty" D'Angelo and two other members who broke with Joseph Bonanno were machined gunned to death in November 1967. This killing may have helped to give credence to the belief that Bonanno had "execution squads" at his disposal. 63 FBI, MM 1231-C-TE TECIP, Miami Office, Aug. 21, 1967, NARA Record No. 124-10293-10329. 64 FBI, La Cosa Nostra, Miami Office, May 4, 1968, NARA Record No. 124-10290-10391, p. 1. One of the hit men was said to be from Denver. 65 FBI, La Cosa Nostra AR-Conspiracy, Miami Office, April 26, 1968, NARA Record No. 124-10288-10463. According to Dara, Consolo was a close associate of Sabella and his execution led Sabella to leave the protection of the Lucchese Crime Family and to return to the Bonanno Crime Family. 66 FBI, La Cosa Nostra AR-Conspiracy, Miami Office, Sept. 5, 1967, NARA Record No. 124-10293-10348, p. 2. 67 FBI, La Cosa Nostra, Miami Office, Nov. 14, 1967, NARA Record No. 124-10289-10186. 68 Sabella was a capodecina under Carmine Galante. By most accounts, Galante was a Joseph Bonanno-loyalist so it seems unlikely that he would have favored Sabella if he had betrayed Bonanno. Nonetheless, Sabella and Dara were cousins and confidants. It's reasonable to think Dara would have been keenly aware of Sabella's activities. 69 FBI, La Cosa Nostra, New York Office, Oct. 20, 1967, NARA Record No. 124-10277-10308, p. 15. 70 FBI, La Cosa Nostra, Miami Office, Sept. 5, 1967, NARA Record No. 124-10293-10348, p. 2. FBI, La Cosa Nostra, New York Office, Oct. 31, 1967, NARA Record No. 124-10293-10325, p. 2. There is evidence that Sabella's loyalties may have shifted with the prevailing winds within the Bonanno Crime Family. 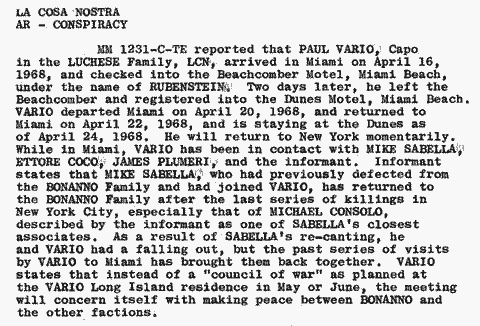 In early 1968, an unidentified New York City-based Bonanno Crime Family member-informant advised that the new Administration had returned some "holdings in Florida which had been taken away from Sabella as a result of his "fence-hopping" during the dissension following Joe Bonanno's fall from power." 71 FBI, MM 1231-C-TE TECIP, Miami Office, Aug. 21, 1967, NARA Record No. 124-10293-10329. Dara said Vario was a favourite of Thomas Lucchese. 72 Some Bonanno Crime Family members tried to escape the fighting by seeking temporary refuge with the Gambino and Lucchese Crime Families during the Banana War. Dara and Vario were from the same part of Brooklyn. 73 FBI, La Cosa Nostra, Miami Office, Nov. 14, 1967, NARA Record No. 124-10289-10186. 74 FBI, La Cosa Nostra, Miami Office, Dec. 1, 1967, NARA Record No. 124-10289-10209, p. 1. Rosato was the brother-in-law of Thomas Lucchese. 75 FBI, La Cosa Nostra, Miami Office, Jan. 16, 1968, NARA Record No. 124-10289-10250, p. 2. 76 FBI, La Cosa Nostra, Miami Office, Jan. 27, 1968, NARA Record No. 124-10289-10278. 77 FBI, La Cosa Nostra, Miami Office, Oct. 29, 1968, NARA Record No. 124-10293-10243. 78 FBI, La Cosa Nostra, New York Office, Oct. 20, 1967, NARA Record No. 124-10277-10308, p. 279. An informant, thought to be a high-ranking Gambino Crime Family member, said the Gambino Crime Family reorganized their Family Administration in February 1967. Carlos Gambino remained official boss but stepped away from day-to-day operations. FBI, La Cosa Nostra AR-Conspiracy, New York Office, Jan. 2, 1969. Colombo Crime Family member-informant Gregory Scarpa told the FBI that Dellacroce had been bumped up to underboss. 79 FBI, MM 1231-C-TE TECIP, Miami Office, Sept. 15, 1967, NARA Record No. 124-10293-10312. 80 FBI, MM 1231-C-TE TECIP, Miami Office, Sept. 15, 1967, NARA Record No. 124-10293-10312. "Big Steve" was described as a " [deceased] junk dealer from New York..." Steve Armone may be the mobster who got taken. 81 FBI, Santo Trafficante, JR., aka T Moetos, Tampa Office, Jan. 6, 1966, NARA Record No. 124-10200-10238, p. 18. FBI, Angelo Bruno, Miami Office, June 19, 1964, NARA Record No. 124-10225-10223. 82 FBI, Santo Trafficante, JR., aka Jose Trafficante, Miami Office, Aug. 19, 1968, NARA Record No. 124-10213-10143, p. 29. Permission to kill Esperti was denied. 83 FBI, La Cosa Nostra AR-Conspiracy, Miami Office, Nov. 14, 1967, NARA Record No. 124-10289-10186. 84 FBI, Santo Trafficante, AKA, AR. Tampa Office, Dec. 7, 1967, NARA Record No. 124-10205-10227, p. 5. A source said that Joseph Indelicato was held partially responsible for murder by his mob superiors because he was thought to have warned Esperti that Altamura intended to kill him. Indelicato had told Altamura earlier that he didn't have the authority to ban Esperti from Miami. 85 The murder was committed in front of witnesses in a crowded restaurant. Esperti received a long prison sentence. He died in 2002. 86 FBI, La Cosa Nostra AR-Conspiracy, Miami Office, Oct. 28, 1967, NARA Record No. 124-10293-10318. 87 FBI, La Cosa Nostra Miami Division, Miami Office, Aug. 22, 1968, NARA Record No. 124-10297-10125. Dara said he would transfer if advised to by Michael Sabella. 88 FBI, La Cosa Nostra, Miami Office, Sept. 5, 1967, NARA Record No. 124-10293-10348, p. 2. 89 FBI, David Yaras, Miami Office, Sept. 23, 1966, NARA Record No. 124-90073-10028, p. 4. St. Petersburg Times, Feb. 23, 1967. 90 The Evening Independent, Feb 22, 1967. John Maloney, the trucking firm owner, was approached by Dara's lawyer, former judge Mitchell Goldman, to change his testimony. Maloney said he was beaten by two thugs and told he would "see his children burned to ashes". 91 Smith, Sandy, "Mobsters in the Market Place: Money, Muscle, Murder," LIFE, Sept. 1, 1967. Smith incorrectly placed Dara and his gang in the Gambino Crime Family. 92 Gainesville Sun, July 14, 1982. It raises the suspicion that Dara received a more lenient sentence because he had already agreed to cooperate. 93 FBI, MM 1231-C-TE TECIP, Miami Office, Sept. 11, 1967, NARA Record No. 124-10293-10346. He said he had to "re-finance" after "monetary setbacks". Was this an attempt to get (more) money from the FBI? 94 FBI, MM 1231-C-TE TECIP, Miami Office, Aug. 21, 1967, NARA Record No. 124-10293-10329. This report refers to an earlier interview (which couldn't be located in the available reports) between the informant and the FBI. The date of the first interview was sometime before Aug. 18. FBI, La Cosa Nostra, New York Office, Oct. 20, 1967, NARA Record No. 124-10277-10308. FBI, Santo Trafficante, Jr., Miami Office, Sept. 13, 1967, NARA Record No. 124-10200-10227. This report indicates he began to share confidential information on Aug. 14, 1967, two days before his sentence was handed down. The rest of the report references a date of Aug. 18, so maybe Aug. 14 is an error. Or it could mean Dara received a lesser sentence than his two codefendants because he had already agreed to cooperate, not because of a bad heart as was the official reason given in court. FBI, La Cosa Nostra Miami Division, Miami Office, Aug. 22, 1968, NARA Record No. 124-10297-10125. According to this report, Dara shared confidential information as early as "May 4, 1967." He told agents that Pasquale Erra controlled criminal activities at the Dream Bar in the Johnina Hotel in Miami Beach. The date was likely an error and should read "May 4, 1968." 95 FBI, MM 1231-C-TE- TECIP, Miami Office, Sept. 11, 1967, NARA Record No. 124-10293-10350. 96 FBI, John Roselli-Victim, Miami Office, Aug. 18, 1976, NARA Record No. 124-10351-10132. 97 FBI, Roskil, Miami Office, Aug. 30, 1976, NARA Record No. 124-10351-10237. 98 FBI, Roskil, Miami Office, Aug. 31, 1976, NARA Record No. 124-10351-10243. 99 Gainesville Sun, July 14, 1982. 100 Pan Am Flight 759 flew between Miami and San Diego with stops in New Orleans and Las Vegas. The airplane crashed shortly after taking off from the New Orleans airport. The crash was blamed on a microburst that forced the airplane down. 101 Gainesville Sun, July 14, 1982. 102 Fort Walton Beach Playground Daily News, Sept. 11, 1981. Dara was freed after posting a $250,000 bond. Others arrested included Bonanno Crime Family member Joseph Puma, who police described as "the godfather of Broward County". Puma was charged with "dealing in stolen property and maintaining a gambling house." Volcansek, Mary L., Judicial Impeachment: None Called for Justice, Champaign: University of Illinois Press, 1993. After his death, Dara was implicated in the bribery of federal judge Alcee Hastings. Hastings was accused of accepting money to reduce the prison sentence of two men. 103 Pistone, Joseph D., with Richard Woodley, Donnie Brasco: My Undercover Life in the Mafia, New York: New American Library, 1987. p 74; Pistone, Joseph, and Charles Brandt, Donnie Brasco: Unfinished Business, Philadelphia: Running Press, 2007. p 92. 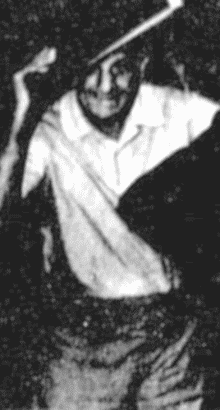 Early in his undercover role, Pistone used an FBI informant in Miami to bolster his bona fides as a mobster. Pistone was supposedly a jewel thief and he did a heist with this informant. Suspicious members of the Colombo Crime Family in Brooklyn phoned this informant to ask him to vouch for Pistone. We don't know what was said, but the informant must have been a significant organized crime figure since his word, from a thousand kilometres away, was sufficient to reassure them. Pistone described him as "mobbed up" and "a thief in Miami who was an informant for another agent down there." Could he have been William Dara? FBI reports show he was an active informant at that time.